LOS ANGELES, CA–(Jan 26, 2015) – Internet Brands today announced that it has acquired Seattle-based Sesame Communications, a leading provider of cloud-based patient engagement and digital marketing solutions for the dental and orthodontic industries. Founded in 1999, Sesame Communications is one of the fastest-growing technology companies in the United States. It serves thousands of dental and orthodontic practices with products and services that help them grow their practices. Sesame Communications joins Internet Brands’ rapidly growing Health portfolio, which includes the Internet’s leading collection of web presence solution providers for health professionals. These include Officite, eDoctors, TherapySites, iMatrix, and Baystone Media. Differentiating Sesame Communications in its category is the company’s proprietary suite of patient engagement and communications solutions. These include patient scheduling and appointment reminder systems, online bill pay and financial reminders, and portals that allow patients to view their appointments and full online health histories. The company also offers traditional web presence services including website design, SEO, and social media support. Sesame Communications will continue to operate from its Seattle headquarters following the acquisition. The company was represented by Cascadia Capital LLC in the transaction. Headquartered in El Segundo, Calif., Internet Brands® is a fully integrated online media and software services organization focused on four high-value vertical categories: Automotive, Health, Legal and Home / Travel. The company’s award-winning consumer websites lead their categories and serve more than 100 million monthly visitors, while a full range of web presence offerings has established deep, long-term relationships with SMB and enterprise clients. Internet Brands’ powerful, propriety operating platform provides the flexibility and scalability to fuel the company’s continued growth. For more information, please visit www.internetbrands.com. Sesame Communications helps dental and orthodontic practices harness the power of the Internet to accelerate new patient acquisition and transform the patient experience. The company supports thousands of practices in their efforts to grow and increase profitability in the digital age. The Sesame 24-7 platform provides an end-to-end, HIPAA-compliant system tailored to the unique and specific needs of dentistry. An Inc. 500|5000 company and 4-time winner of the Pride “Best of Class” Technology Award, Sesame is recognized as one of the fastest growing technology companies in the United States. For more information about Sesame, visit www.sesamecommunications.com. 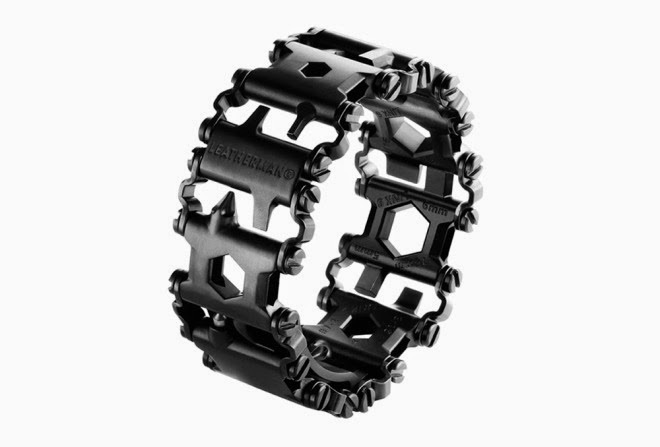 A version of the Tread bracelet that includes a watch will be available in Fall 2015. The Leatherman TreadTM QM1 will feature a unique Leatherman-designed and Swiss-made timepiece with precision quartz movement. A shock resistant sapphire crystal ensures scratch resistance for heavy duty wear, and the curved watch limits reflection and increases outdoor visibility. Another year, another list of bad passwords. Google has announced a major shakeup of its Google Glass business, refocusing its efforts around enterprise applications and ending its Explorer program where individuals could buy the high-tech eyewear. In a post on Google+ the tech giant explained that Jan. 19 will be the last day to get the $1,500 Glass Explorer Edition. “In the meantime, we’re continuing to build for the future, and you’ll start to see future versions of Glass when they’re ready,” it added. Is Delta Dental of Missouri Playing Fair with Missouri Dentists? I received this information yesterday from trusted friends whom I have known for years. They have given me the OK to post this information here. For the full rundown on this situation, there is a great article available from the ADA. Friday we received a mailing from Delta. Included in their letter was information about Delta's annual meeting and the election of directors. The legal agreement that we reached in the lawsuit spelled out specific steps that were to be taken regarding their annual meeting and election of directors. Delta's letter included information about their candidates, but had no mention of the candidates that have been nominated by petition. This, in our opinion, violates "the spirit of the agreement". We believe that this is an attempt by Delta to taint the election process by implying that "their candidates" are the only candidates that will be on the ballot, or at the very least, that their candidates are the "best" candidates. It seems that this letter, although not specifically prohibited by the legal agreement, is in poor taste, and once again shows that Delta is not being transparent in their dealings. We will shortly send to our members information about the candidates that have been nominated by petition. We hope that you will make an informed decision when the election of directors by mail ballot is held later this month. It seems that Delta is also not making it easy for us to get the list of its members (participating dentists), so, at least for now, this is our only means of contact. Delta, so far, has agreed to give us a copy of the list, but only if we agree to pay $.20/page! We will gladly pay the copying charge, we think it is petty, but we are not surprised! We have requested the list electronically, so far they have denied that request, again, we are not surprised. We believe that these actions are uncalled for, what do you think? We hope that you will carefully consider all of the candidates as you elect directors to the Delta board. Do you want business as usual? We believe that there are candidates who will not hesitate to move Delta in a new direction. Please keep in mind that these are the opinions of the three of us, each a past president of the Missouri Dental Association. They are not necessarily the opinions of any dental society, state or local, although the three of us have the support of large numbers of the members of the American Dental Association, the Missouri Dental Association and the component societies of the MDA. I've been a customer of DRNA for several years now. We try and run an office that does things in a state of the art manner, and that includes keeping our environment as pristine as possible. To that end, we installed an amalgam separator from DRNA. Many states are beginning to require one of these devices to be installed in a dental office, but we made the commitment to be proactive because it's better for the environment and we thought it was just "the right thing to do." Even though the State of Missouri does not require an amalgam separator we made the decision to install one... and we are glad we did. We're pretty sure the fish and other aquatic critters are glad as well. As dentists we remove lots of silver fillings and, while there isn't a lot of mercury in them, there is some. Amalgam separators are devices designed to remove amalgam waste particles from dental office wastewater. Without an amalgam separator, these particles can be suctioned into the dental unit vacuum line and discharged into the public sewer system. NEW YORK, NY January 14, 2015: As an extent of its corporate social responsibility, Dental Recycling North America, Inc. (DRNA) has agreed to donate a portion of its profits to Gastromotiva, a non-profit organization operating in Brazil since 2006. The organization runs training courses, holds events, and engages in projects on gastronomy to promote social development in Brazil. Gastromotiva provides qualification courses to young people in socially vulnerable populations and from low-income families as well as supports programs for micro-entrepreneurs. The primary course that Gastromotiva offers aims to prepare students to join the work force in the realm of gastronomy. "I feel very thankful to start this partnership with DRNA. As I said at the Clinton Global Initiative, our belief is that we can transform million of lives by leveraging the gastronomy universe and we need individuals and companies who share the same dream to take this road with us. DRNA really captured the idea and it's no coincidence that we have likely commitments with the society", said David Hertz, chef and founder of Gastromotiva. "Ensuring the integrity of local food systems is part of the objective of DRNA", said Marc M. Sussman, President & CEO of Dental Recycling North America, Inc. "The company's primary goal of keeping mercury out of the environment helps to safeguard the health of local agricultural systems and ultimately its people. By assisting Gastromotiva in achieving its goals, DRNA is working to extend its influence in promoting a healthier living for all." Further information on Gastromotiva can be found by visiting their website. Today's post doesn't have anything to do with dentistry or healthcare, but as a diehard geek, I think sometimes I just have to let my readers know what really gets my inner-geek revved up! One of the things that got me involved with technology in the first place is the joy of DIY (Do It Yourself) projects. I started out my technology journey by taking computers apart after hours. I was a young dentist and had lots of time on my hands after hours. I began taking computers apart to perform upgrades and found that I had a knack for that sort of thing. So, as I've gotten further and further into tech, I have developed a great respect for other DIY people and their labors of love. Things like the device above. Needless to say, but I will say it anyway... Do Not Try This At Home!!! I have not and will not attempt this build and you should not either. This is placed here because it is a great example of what can be done with engineering and ingenuity and it is a cool academic exercise. The gentleman here is Ivan Owen. He has a cool job making prosthetics for children. This, however, is a project that is a lot more dangerous. It turns out that cornstarch is pretty flammable... as you can see by the video above. What Ivan has here is a battery operated leaf blower, a sifter (like you can find in a bakery), and a small propane blow torch. I'm not going into great detail here on purpose. As I said before here... Do Not Try This At Home!!! To me it looks like the sifter is used to drop a uniform and consistently fine increment of powder into the stream of the leaf blower where it is then blown over the flame of the propane torch and ignited. The flame is used to repel the zombies on the sticks. Please... Do Not Try This At Home!!! However, it *is* pretty cool to watch. Ivan Owen has his own YouTube channel as well that has other pretty cool projects he's working on. I've always liked the marketing of Chik-Fil-A, even before they came to the Kansas City area. I would occasionally be watching some cable channel they advertised on & I would see the cows (shown above) and I couldn't help but smile. 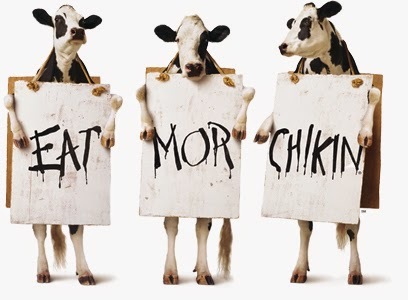 In my travels around the country, I'd see the billboards with the cows and, even though I'd never eaten there, I'd smile and think that it had the kind of attitude I like. However, all that being said, I had no idea how big a fan I would become later on... that has to deal with today's post. When Chik-Fil-A came to the Kansas City area, I had friends tell me that I just had to go because they had the best chicken sandwich in the world. These were friends not prone to hyperbole, so I figured that it had to be a pretty good sandwich. The only complaint I ever heard was that they cost a bit more than other places, but I've always believed in paying for quality. Anyway, I tried the place and my friends were right!!!!! It was a great chicken sandwich. I was hooked. It was especially bitter on the afternoon of January 7th and a good many folks had taken a respite from the cold by grabbing lunch at the Chick-fil-A on Highway 280 in Inverness. “It all comes from Truett Cathy and the Cathy family and the principles Chick-fil-A has been established on,” he said. Thank you Chik-Fil-A for showing us how to treat our fellow human beings. This isn't a business lesson, this is a life lesson. One we can all learn from and repeat to as many as possible. Video 3D Mapping Can Change Faces... Are Their Dental Applications/Implications Here? Take a look at the video above. It seems that researcher Nobumichi Asai has developed a way to project onto the human face. By placing some dots on the model's faces for the projector & software to read, the system then uses the faces as a projection screen. It's pretty amazing to watch & I won't bore you with all of the details. Just watch & you'll see what I mean. While I was watching this, I was thinking of the possibilities of what scanning like this might mean to dentistry & plastic surgery. Can you imagine being able to project right onto a patient's face what they might look like after a cosmetic dentistry makeover or a plastic surgery procedure? Being able to see it projected on your own face is the next best thing to *the real thing*. 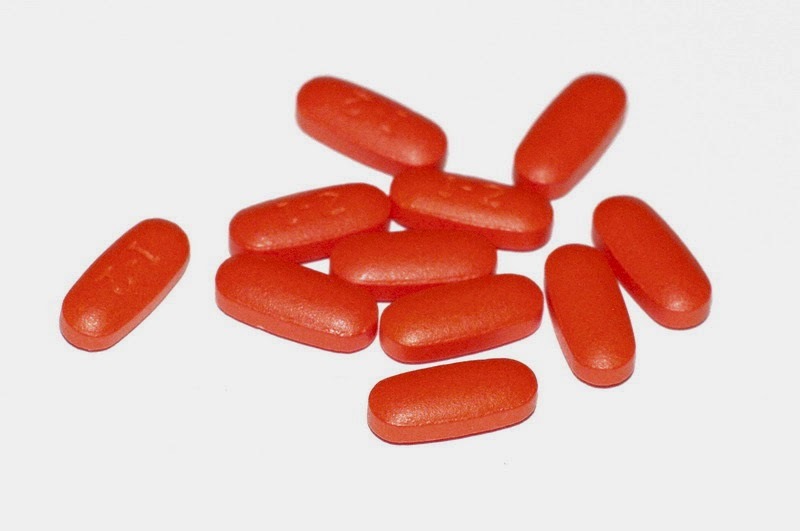 One of the most commonly used types of medications used both in medicine and also over the counter is a class of drugs called NSAIDs. It stands for "non-steroidal anti-inflammatory drugs". These medicines are frequently used because they are non-narcotic and effective. They help decrease fever, decrease the response to pain, and decrease inflammation. Now comes word that, in addition to the benefits listed above, an even greater benefit *may be available*. It seems that researchers at Buck Institute and Texas A&M University administered doses similar to an equivalent dose for a human to 3 different species. These were flies, yeast, and worms. Amazingly all 3 different organisms lived longer... 17% longer for yeast and 10% longer for flies and worms compared to the experimental control organisms. All of these increases are significant. Obviously this doesn't automatically mean we should all begin taking dosages of this medication to live longer. Many more studies and evaluations need to be done. However, as someone who loves (and frequently gets to live) science, I find this intriguing. Here is the info from Buck Institute. The Texas A&M page will all of their information is here. My pal Chris has *got* to be beaming about this! Go Aggies!!! This is the second post on Brasseler in as many days, but I think this one is important. The addition of silicone inserts into bur blocks may seem miniscule, but it truly is a game changer. Anyone who has ever dropped a bur block or knocked one off the counter during a procedure (c'mon don't deny it's happened to you) knows that the tiny burs scatter in all directions. The silicone "donuts" hold the burs gently, but firmly in place and keep them from falling out. I noticed some manufacturers tinkering with this concept about 18 months ago and I promptly began advocating for their usage to every bur company I had a conversation with. It's nice to see that folks have listened. This is just one more reason to take a look at "the little things" when making purchases. 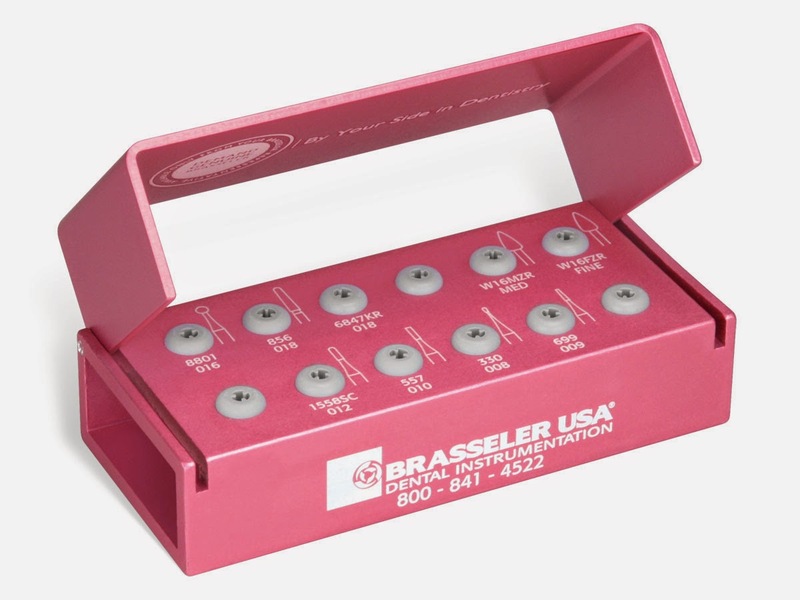 SAVANNAH, GA (January 6, 2015) – Brasseler USA®, a leading manufacturer of quality instrumentation, is pleased to introduce an updated version of its standard aluminum bur block. Brasseler USA now offers aluminum bur blocks equipped with silicone inserts for optimum security and organization. The newly added silicone inserts provide a number of benefits making custom rotary procedure organization efficient and easy. The burs rest within the silicone inserts inside the aluminum block providing enhanced instrument retention, securing the bur firmly in place to avoid common slip or fall-out incidents. The new and improved aluminum bur blocks with silicone inserts are available for both clinical and laboratory rotary procedure instruments. 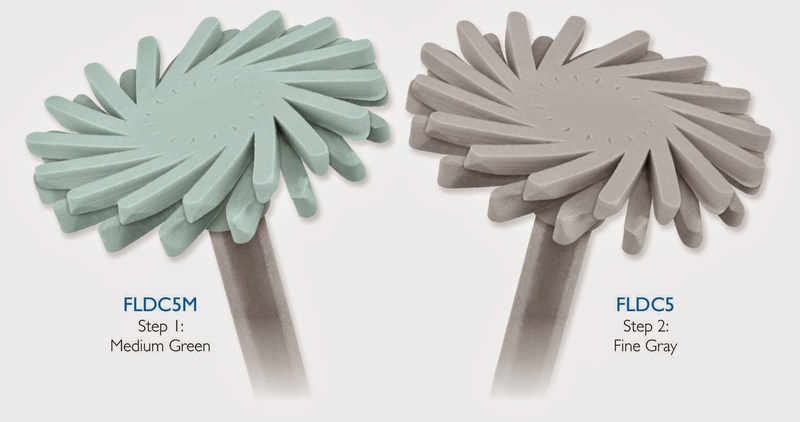 The bur blocks are available in a wide variety of colors making rotary procedure organization completely customizable for each unique individual practice requirement. Available in a wide variety of sizes and slot numbers, the updated aluminum bur blocks have a versatile layout design with silicone inserts ready to accept any size or shape bur. The bur blocks are fully autoclavable and are validated for both block and instrument sterility. 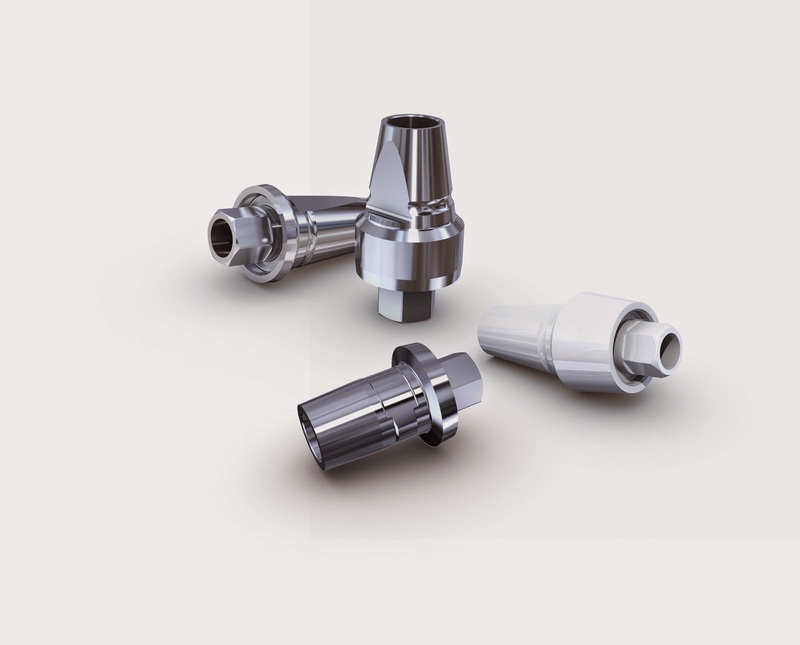 Moreover, the updated aluminum bur blocks are completely customizable to include laser-etched clinician or practice name, procedure, bur numbers and silhouette. Users can simply match up shapes, colors, and/or customized laser-etched bur blocks to experience unprecedented rotary procedure organization for custom-made configuration of burs and diamonds. SAVANNAH, GA – Brasseler USA®, a leading manufacturer of quality instrumentation, is pleased to expand its Feather Lite™ line of polishers with a new versatile intra-oral composite polisher, the DiaComp™ Feather Lite™. The DiaComp Feather Lite is a simple two-step diamond infused polishing system that provides consistent and reliable results for the polishing of the widest variety of composite materials. The highly efficient DiaComp Feather Lite is extremely versatile and works well on all types of classic restorative composite materials as well as new hybrid composites. The unique finger design and flexible spirals of the DiaComp Feather Lite create an esthetically pleasing enamel-like finish while respecting existing surface differentiation. In addition, the DiaComp Feather Lite delivers a quick high-shine luster on every surface including hard-to-reach locations such as the occlusion region, leaving behind a complete finished surface area. The DiaComp Feather Lite works most efficiently at lower speed ranges (5,000-6,000 rpm) while using light pressure. After using the ET® Carbides and Diamonds to finish your composites, using Diacomp Feather Lite will maintain surface differentiation and restore a natural finish.